Bird Box, the Netflix original film, started streaming on December 21 while I was on vacation.1 That perhaps explains why the majority of my exposure to the Netflix Original came via NBA Twitter — and most of that exposure had absolutely nothing to do with the film, at least not directly. That was quite the flex, and Netflix was only getting started. There is an argument that Bird Box viewership numbers — which, as of Netflix’s earnings report last week, are up to 80 million Netflix member households — are not particularly meaningful. Sure, taking the wildly conservative assumption that one household=one viewer would mean that 80 million viewers was the equivalent of a box office haul of over $700 million2; increasing that to two viewers per household would imply an equivalent box office haul that would rank in the top 10 of all time. The problem, of course, is that none of those 80 million households actually paid explicitly for Bird Box: they got the movie for “free” with their Netflix subscription, and it seems like a stretch to think that most of them would have paid box office prices that are roughly as expensive as a month of the streaming service, to see the movie on purpose. This critique is both true and misses the point — three points, actually. First, it is not as if Netflix is counting on box office receipts: to point out that the company isn’t earning $700 million or $1.4 billion or whatever is even more of a moot point than the number of people that watched Bird Box. Secondly, and relatedly, Netflix is counting on subscription revenue. To that end, producing a piece of content that 58% of its subscriber base viewed in a single month is by definition a triumph (and yes, worth ~$700 million). Third, and most importantly, the success of Bird Box drives the virtuous cycle that Netflix has as an aggregator in multiple ways. For current customers, Bird Box provides two hours of entertainment and a pass into popular culture. It is a cost of goods expense. For prospective customers, Bird Box makes Netflix more attractive for the same price. Or, to look at it another way, it lowers Netflix’s customer acquisition cost. It is a marketing expense. For marginal customers, Bird Box is a reason to stay on the platform. It lowers Netflix’s customer retention cost. It is an operating expense. The question, then, is why do suppliers come onto Netflix’s platform? Second, because of the demand-side dynamics I just described, Netflix is not simply selling to today’s subscribers, but the subscribers it anticipates attracting over the next several years, giving Netflix greater buying power again. Third, because Netflix is not monetizing any particular piece of content in isolation, but rather as part of an overall subscription offering, it can more easily absorb failures on one hand (its customers have other shows to watch), and capture excess value on the other (because the lifetime value of customers is far greater than a single movie ticket). This means that Netflix’s risk, relative to traditional distributors, is significantly biased towards the upside, justifying higher prices. Secondly, Netflix has long appealed to the other motivations a supplier might have, particularly creative control. What the success of Bird Box shows, though, is that Netflix is uniquely capable of driving an audience as well. Sure, the company spent money on marketing Bird Box, but the reality is that Bird Box was popular because it was on Netflix. That is what drove views, and what drove Bird Box into the popular consciousness, and while all suppliers like getting paid, artists in particular like to be seen. And so we have a virtuous cycle: Netflix’s control of demand draws suppliers, which increases demand, and so it goes. With respect to the price changes…you’ll see that impact over the course of the year, and what that means is that will obviously impact the rate of net addition growth in the first half of the year. But commensurately, you also see ASP domestically improve over the course of the year and that’s what we think will drive an acceleration in revenue growth over the course of 2019. And that’s what also we believe drive operating margin higher sequentially over the course of the year to enable us to hit that 13% target for the full year. One of the obvious challenges for Netflix, particularly in the United States, is saturation. The company has 60 million subscribers in the U.S., which as of 2017 had 126 million households; given widespread account sharing, the company’s penetration is almost certainly well over 50%. There is still room for growth — around 100 million households have traditional multichannel video programming (i.e. the cable bundle) — but by definition households without Netflix are either exceptionally hard to reach (which is why Netflix has partnered with MVPDs to sell the service) or exceptionally frugal. Raising the price will certainly further inhibit the latter with their presumably high price elasticity. 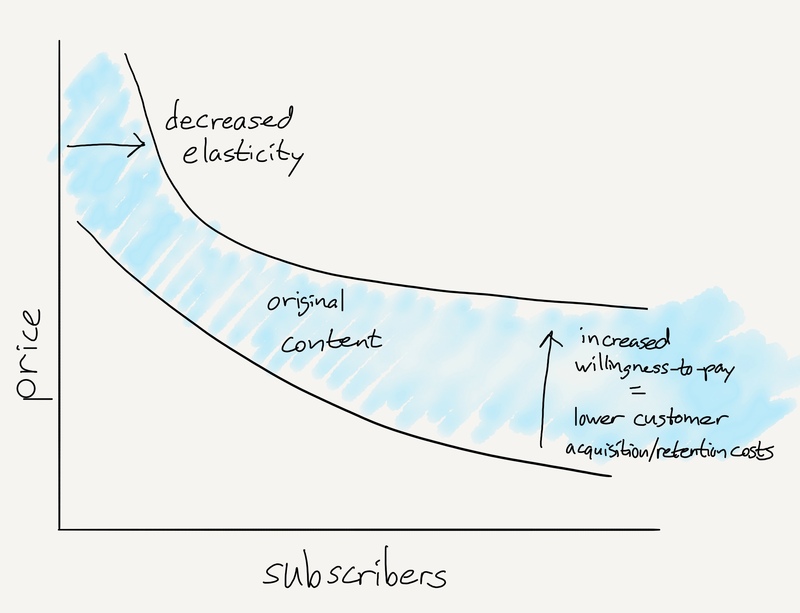 This is a graphical representation of the point I made above: existing customers are less price elastic, and marginal customers are more likely to stick around or sign up. Critically, this is a win for every part of the value chain: subscribers get more value, Netflix gets more revenue, and there is more money for suppliers. Much of this is obvious, at least at this point, but it is particularly noteworthy in the context of Netflix’s competitors. The traditional MVPD value chain, for example, has four participants: suppliers, networks, distributors (cable, satellite, or virtual), and end users. This made sense when the chief constraints were time and the need to actually run a cable into the back of an end user’s television, but it is a significant handicap in a world where there is no time constraint and where distribution is over the Internet. Comcast’s NBCUniversal plans to debut a free, ad-supported streaming service to anyone that subscribes to a traditional pay-TV service, including competitors such as Charter, AT&T, Cox and Dish, in the first quarter of 2020, the company announced Monday. For those that don’t subscribe to a pay-TV service, the streaming product, which will include 1,500 hours of NBC TV shows, such as SNL and Parks and Recreation, and hundreds of hours of Universal movies, will cost somewhere around $12 a month, a person familiar with the company’s plans told CNBC. The service will be run by Bonnie Hammer, the company announced Monday. In short, TV Everywhere was an attempt to apply a value chain that was created around cable television to a fundamentally new paradigm, which introduced massive amounts of misalignment and inefficiency, most of which was borne by the end user. And oh, by the way, the old business model of advertising as well. Contrast that to Netflix which has created a value chain perfectly attuned to the streaming paradigm. Our main goal is to make the best content. And we’ve said in previous quarters that that is a combination of several different business models depending on who owns the IP. So, what we’re going to do is make the best show and not be stuck on the business model, because the consumer really doesn’t understand that or we even want to spend any time thinking about it. So by way of example, last year, we had 140 different shows around the world that premiered on a network somewhere and on Netflix everywhere else in the world. Next year, it’s more to closer to 180. And these are combination of co-producing with local producers in other countries; it shows that then air on a network in that country and then premier on Netflix. But when I say co-production, I mean, we come in at the script stage, we come in at the first money stage, we’re involved creatively with the production of that show. Netflix has shows it owns completely, shows it own first-run rights to, hybrid shows like Hastings described, second-run shows — it runs the gamut. Critically, while some models are more profitable than others, all make the service more attractive to Netflix’s customers. This will be a particular challenge for a company like Disney: the company is staking a good portion of its future on its own streaming service driven by its own IP, but has not suggested a willingness to scale supply like Netflix has. That, by definition, will limit the company’s upside when it comes to consumer reach and also long-term pricing power. This is perhaps the biggest flex of all: Netflix is so confident in its position it is effectively stating that if customers choose to watch TV, they will choose Netflix. The company knows its model is that much better.